Salads can be an interesting way to enjoy a healthy meal with a difference. 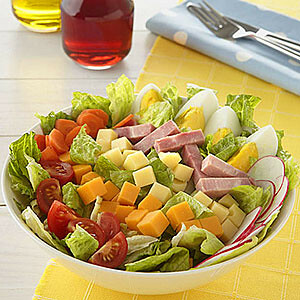 The Chef’s Salad combines a variety of protein with vegetables. Toss the greens in a large bowl, dividing them into four salad bowls. Arrange the meat, cheese, eggs, tomato, and sweet pepper on top. Sprinkle with croutons. Drizzle with salad dressing. For variations there is the Italian Chef’s Salad made with 2 ounces cooked chicken and 4 ounces mozzarella cheese, no eggs, 2 ounces sliced pepperoni, one 6-ounce jar quartered marinated artichoke heart quarters, drained; and 1/4 cup sliced, pitted ripe olives. For dressing, use a creamy Italian salad dressing. A Mexican Chef’s Salad will require cooked chicken, beef, or pork and cheddar cheese or Monterey Jack cheese, no eggs, one 4-ounce can diced green chili peppers, drained, and 1/4 cup sliced pitted ripe olives. Use corn chips instead of croutons.